Owner Ed Stanco leads Princess of Sylmar to the winner's circle after the Oaks. 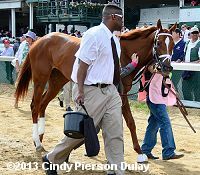 The $1,000,000 Kentucky Oaks (G1) is the premier race in the country for 3-year-old fillies, and is the female counterpart to the Kentucky Derby. After the scratch of Flashy Gray, a field of only 10 went to post in this 1 1/8 mile main track feature at Churchill Downs on Friday before 113,820, the second highest Oaks attendance in history. The weather was breezy and warm, in the high 70's, with intermittent clouds. 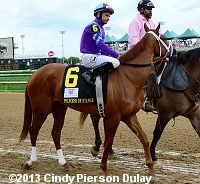 Gulfstream Park Oaks (G2) winner Dreaming of Julia was sent off as the 3-2 favorite over 7-2 second choice Midnight Lucky, winner of the Sunland Park Oaks last out, and 9-2 third choice Unlimited Budget, undefeated in 4 races including the Fair Grounds Oaks (G2). Down the stretch in the Kentucky Oaks. Jockey Rafael Bejarano sent Midnight Lucky to the lead first time past the stands and she set fractions of 22.84, 46.79, and 1:11.34 while pressed by 9-1 Beholder. Entering the stretch, Midnight Lucky tired allowing Beholder to inherit a 2 length lead through 1 mile in 1:36.11. 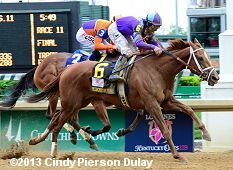 39-1 Princess of Sylmar, 9th early, came out 4 wide and closed with a rush to win by 1/2 a length in 1:49.17 over the fast main track. It was another 2 lengths back from Beholder to Unlimited Budget third, and a head back to favorite Dreaming of Julia fourth. Pletcher, who will saddle five runners in Saturday's 139th Kentucky Derby, is in position to become the first trainer since Ben Jones in 1952 to win the Oaks and Derby in the same year. Jones won the Oaks with Real Delight and the Derby with Hill Gail. There were five other stakes races on the card with the Oaks. Full results for all of them with more photos are here. Left: Princess of Sylmar heads to the winner's circle. Her jockey Mike Smith said, "It was extremely rough leaving there. We got banged around pretty good but she settled right into stride. After that, I just rode her like Todd had told me to, to be honest with you. They thought they had moved a little early last time out and to really be patient. And when you think it's time to move, maybe even be a little more patient. It really worked out great." Right: Princess of Sylmar gets water tossed on her before heading back to the barn. Left: Princess of Sylmar heads into the paddock before the race. 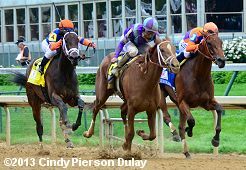 Her trainer Todd Pletcher said, "We're pleasantly surprised with her effort and her win. We didn't much like her first breeze here (:48.60 April 20), but her second one (:49.20 April 27) was much better done. She's a good filly; we knew that all along. And we took her out of her natural running style last time. This time she made that good run and got it done." Right: Princess of Sylmar in the post parade. Left: The start of the Oaks showing how several of the fillies got roughed up, including eventual winner Princess of Sylmar. Right: Second place finisher Beholder returns after the race. 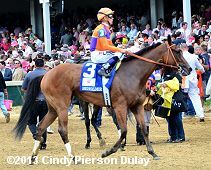 Her trainer Richard Mandella said, "She ran great and I'm proud of her. But she might have lost this race in the post parade. She was so full of herself and so wanting to go, that she was a handful in the parade and she gave the pony a heck of a time. Oh, well. At home, we can get her to settle down, but here - with all the people - it was a different story. But she ran well and we're proud." Left: Third place finisher Unlimited Budget in the post parade. Her trainer Todd Pletcher said, "It was a really good race for her. She was in a good spot and looked like she might be able to be right there at the finish. But today just wasn't her day." Right: Fourth place finisher and beaten favorite Dreaming of Julia in the post parade. 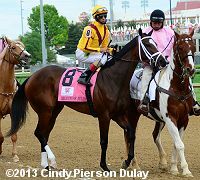 Her trainer Todd Pletcher said, "She lost it out of the gate. She got creamed coming out of there and it is hard to overcome that sort of thing. She tried hard to make it up and I thought she ran very courageously. But it was too much to ask." First time by with Midnight Lucky and Beholder leading and Princess of Sylmar next to last. Midnight Lucky's jockey Rafael Bejarano said, "I had a good trip. My horse broke right on the top, really good. I tried to settle the pace, but I had a little pressure. I was really comfortable in the beginning with my horse. By the 1/2 mile pole, she was getting tired. She didn't have any excuses."